So many Greek islands, so little time… Cyclades, Dodecanese, Sporades, Ionian…literally hundreds of islands, thousands if you count the uninhabited ones, and why not count them? They’re there, they’re islands, they deserve to be recognized. However, in order to stay relevant, we’ll stick to the inhabited ones, and then narrow it way down to a few that possess just the right combination of scenery, personality, infrastructure and accessibility. While I’m sure most islands have some drama in their past; on that front, I venture none can compete with Santorini. The island as we know it is the caldera of a volcano which erupted in one of the largest explosions ever known on this planet around 1600 BCE. Ash and debris shot 25 miles into the stratosphere and the massive tsunami that followed brought immediate destruction, as well as prolonged environmental devastation that lead to the extinction of the powerful Minoan civilization. The Minoans were centered in Crete but their influence was widespread and they had colonies on a number of Aegean islands. 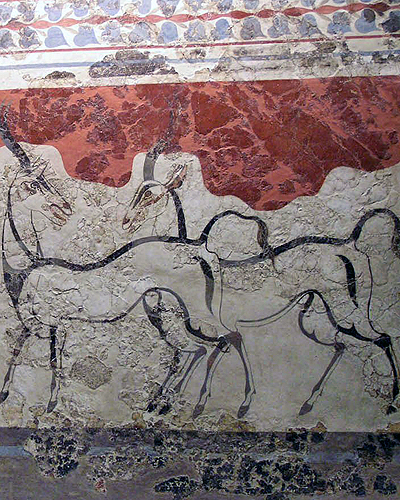 Akrotiri on Santorini was a Minoan settlement that was preserved in volcanic ash, much like Pompeii. No human remains have been found, so it would seem the inhabitants got out in time. What remains is evidence of a very wealthy, sophisticated city. A powerful city that sank into the ocean in a single day, hmmm, does that sound familiar? Could it be Atlantis? Some think so, scholars even. Visit Akrotiri and decide for yourself. Despite an explosive history, Santorini is a very peaceful place, and thanks to its explosive history, Santorini is extraordinary to look at. Santorini is all about the views. You sit on your hotel terrace and look at the view, you eat your meals looking at the view. When walking around, you really must try to stop looking at the view and watch where you’re going because there are some pretty steep drops. Most habitation is perched on the caldera rim, a sheer 1,000 feet over the sea. Fira is the main town, with the most happening. Oia is a little out of the way, quieter and more romantic. 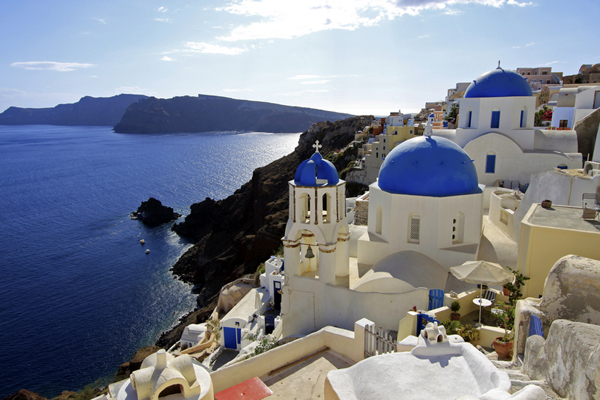 Imerovigli is closer to Fira but quiet and sits higher than either Fira or Oia, so claims superior views. Really, the views are good everywhere, as long as there’s nothing in the way. Most (if not all) Greek island cruises stop in Santorini for a few hours. In season (April/May-October) there are frequent flights and ferries from Athens. This entry was posted in Greece and tagged Athens, Crete, Cyclades, Dodecanese, Fira, Greece, List of islands of Greece, Santorini by yalla2013. Bookmark the permalink.